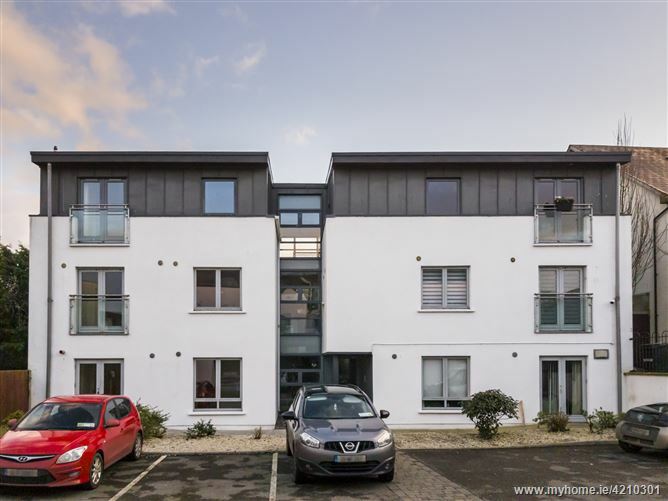 No 6 Charter Hall is a spacious two bed apartment in a superb location just off Patrick Street Trim behind electric gates with secure parking. Accommodation is bright and airy throughout with extra high ceilings, double doors leading onto a spacious balcony letting in ample sunshine. This is an ideal home for any first time buyer, investor being located in the centre of this lovely Heritage town close to shops, schools, pharmacy, hotels, churches, restaurants, and an excellent bus service to the capital on a daily basis. The property is in excellent condition throughout and viewings are highly recommended by the sole selling agents. Kitchen area with fully fitted kitchen, ample storage with a tiled floor. TV & Telephone points. Ensuite 1.9m x 1.1m with wc whb, and shower- tiled floor. Bedroom two 3.2m x 2.7m with wooden floor and built in wardrobes. Bathroom 3.3m x 2.1m with wc, whb and bath- tiled floor. Viewings are highly recommended by the sole selling agents.